Maybe we've missed it at Substance, but we haven't read in the eulogies in the corporate media that one of the last acts by Maya Angelou as a public intellectual in the United States was to join in a denunciation of the test craziness forced across the nation by President Barack Obama and his "Race To The Top." The authors' Letter to President Obama criticized federal education policy in no uncertain terms. And of the more than 100 authors and illutarators of children's books who signed the appeal, Maya Angelou stood proudly. 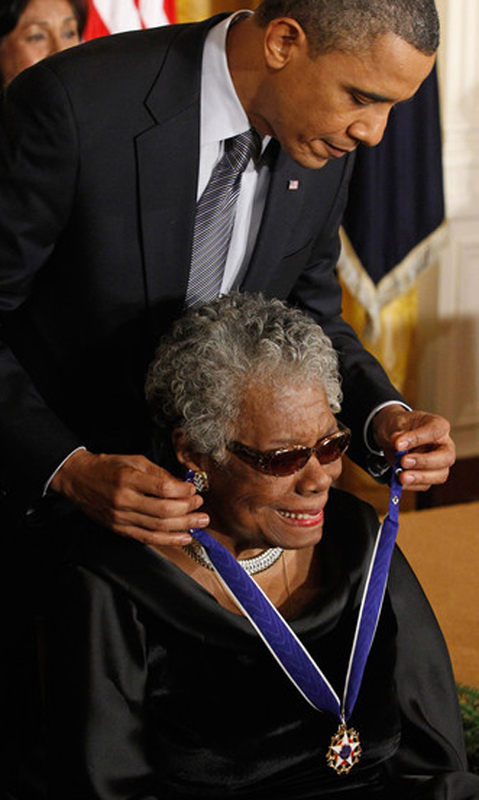 Maya Angelou defended President Barack Obama against the racism of many of his fiercest critics, but he didn't even respond to her criticism of the federal government's Race To The Top test-based corporate school "reform" program.There was no mention of her opposition to federal testing mandates in White House, City of Chicago, and other official proclamations about her life. We the undersigned children�s book authors and illustrators write to express our concern for our readers, their parents and teachers. We are alarmed at the negative impact of excessive school testing mandates, including your Administration�s own initiatives, on children�s love of reading and literature. Recent policy changes by your Administration have not lowered the stakes. On the contrary, requirements to evaluate teachers based on student test scores impose more standardized exams and crowd out exploration. Teachers, parents and students agree with British author Philip Pullman who said, �We are creating a generation that hates reading and feels nothing but hostility for literature.� Students spend time on test practice instead of perusing books. Too many schools devote their library budgets to test-prep materials, depriving students of access to real literature. Without this access, children also lack exposure to our country�s rich cultural range. Which of the following best describes the effect of the metaphor in the stanza above? A. break the bars that confine it. B. not hope to see the outside world. C. soon grow to accept the situation. D. be consumed by its own anger. No, she didn't write the test questions, but she held the copyright to the work that was used.